At the Clinton Global Initiative meeting this week, former President Bill Clinton called for corporate tax reform as a “practical economic” need. "We're bailing water out of a leaky boat,” Clinton said. “And the only two things you can plug the leaks in that boat: Either we undertake corporate tax reform, or every other country in the world says, 'We are wrong and we’ll go back to the way we used to do it.'" Today, the corporate tax rate across the OECD sits at about 25 percent—10 percent below our federal corporate tax rate and nearly 15 percent below our federal and state average combined tax rate. Since Clinton raised the corporate tax rate in 1993, every OECD country except the U.S., France, Hungary, and Chile has lower its corporate tax rate (though Hungary and Chile, remain below the OECD average at 19 and 20 percent, respectively). 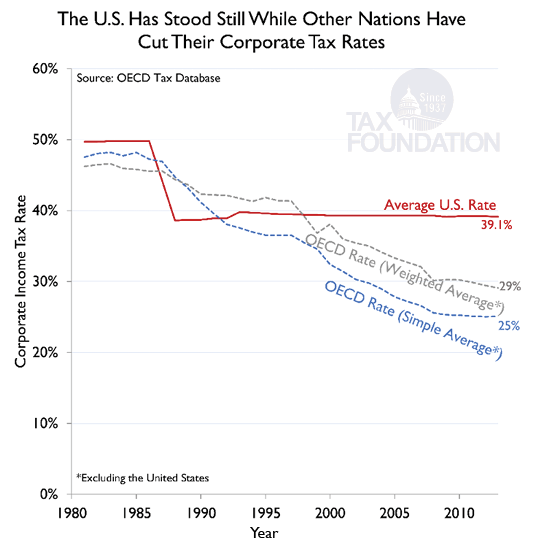 To bring the overall U.S. corporate tax rate down to the OECD average of around 25 percent, the federal tax rate would need to drop to about 20 percent before adding in the average corporate tax rate across the states. Clinton has discussed the need to reform corporate taxes in the past, which we covered here and here.